But real life is different. Both Charlotte (Philadelphia) and Ben (Louisiana) find themselves alone. Charlotte's discovering that her best friend is moving on to a different group of girls. Ben has always been a loner. And both of them are dealing with big life changes. Charlotte's dad is in the hospital after having a heart attack and Charlotte's ridden with guilt over how they've been growing apart. Ben's parents just told him they're getting a divorce, his home life will never be the same. Over the course of a week and many narrative turns back and forth (mimicking the turns taken at Scrabble), Charlotte and Ben will come to depend on each other much more than they ever had before. With no one else to turn to, they turn to each other as they start to navigate the muddled, confusing waters of middle school. Oh, this one got me in the feels. It's not overtly heartbreaking, but it's heartbreaking in its way of describing exactly how it feels to be in middle school and be totally flummoxed by how others are acting. The small (and big) actions of the other kids are so cruel, but so commonplace. As I was reading, my heart ached for these small, confused kids just beginning to grow up. Erin Entrada Kelly is a master of showing her characters rather than telling you all about them. Sometimes the things she leaves out are even more important than the things she leaves in, letting readers discover Ben and Charlotte as they read the novel. This book reminded me so much of the Judy Blume books I read as a kid - books I read when I wanted to meet characters like me dealing with middle school life. This is a great followup to Kelly's Newbery-winning Hello, Universe (Greenwillow, 2017). Readers who loved her character development in that book will find much to love in You Go First. The tone of the book reminded me a lot of Goodbye, Stranger by Rebecca Stead (Wendy Lamb, 2015), which is another character-driven book that explores middle school through the eyes of several characters. 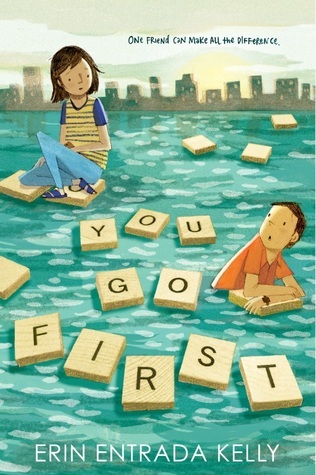 You Go First by Erin Entrada Kelly. Grades 4-7. Greenwillow, 2018. 304 pages. Reviewed from ARC snagged at ALA Midwinter.